In the Old Testament, the Israelites built altars where they made sacrifices. 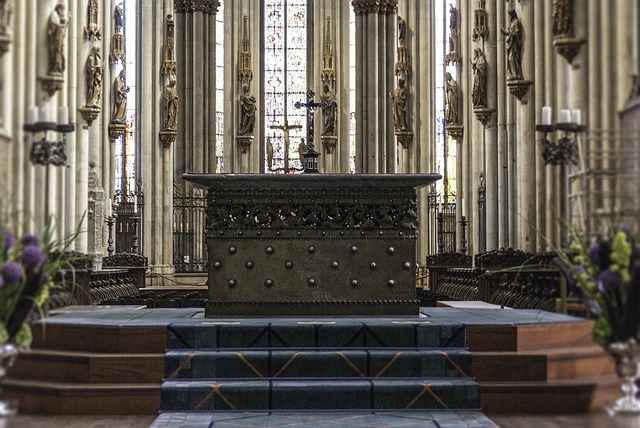 Often these altars were memorials to encounters with the Lord. In Genesis 12, when God rewarded Abram’s obedience and gave him land, Abram built an altar. In Genesis 26, when God spoke to Isaac saying, “Fear not, for I am with you,” Isaac built an altar. In Exodus 17, after a great victory, Moses built an altar and named it, “The Lord is my banner.” It was a reminder that God had given them victory. You and I can follow the example of Abram, Isaac and Moses by building altars in our hearts and minds to remind us of the times God has demonstrated his love for us. And then there’s the issue of forgiveness. Jesus said, “If you are offering your gift at the altar and there remember that your brother or sister has something against you, leave your gift there in front of the altar. First go and be reconciled to them; then come and offer your gift” (Matthew 5:23-24). Oh my! This is so important and so hard! We need to seek forgiveness from those we have hurt or offended and forgive those who have hurt or offended us. I think doing those two things helps clean out our pipeline of worship – making a clear way for our prayers to God. If our prayers seem to “stop at the ceiling”, we probably have some forgiving to do and some apologies to make. Tear down those altars where we worship anyone or anything other than God. Build altars in our hearts and minds to remind us of the great things God has done. Forgive others and ask for forgiveness. Make our sacrifices of prayer, praise, good deeds and sharing. If we do these things — you know what? We’re going to be pleasing to God! This entry was posted in Commandment, Forgiveness, Obedience and tagged Pleasing God, Practical Christianity by brendakoinis. Bookmark the permalink.